Scott Pruitt has been selected by Donald Trump to be the next head of the Environmental Protection Agency. Pruitt’s selection is both controversial and alarming, given his persistent criticism of the EPA and his relationships with fossil fuel interests in energy-rich Oklahoma. Clean energy and other environmental interests are lining up to oppose Pruitt’s nomination. 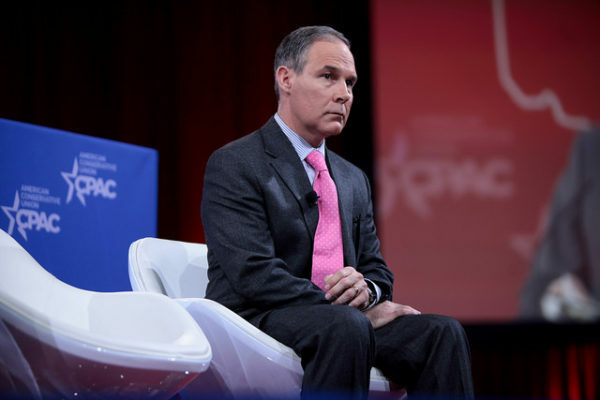 Pruitt, 48, is an attorney who served eight years in the Oklahoma state senate prior to being elected attorney general in 2010. As AG, he established a “federalism unit” and has prided himself on contesting what he sees as federal “command and control” regulatory overreach into state matters. For example, he points to the Clean Water Act, which he says was originally passed by Congress to allow the federal government to protect “navigable waterways” but which authority was expanded by the Obama administration to include any water source “with a nexus to a navigable waterway.” Oklahoma and other states filed a lawsuit which has been successful in halting the imposition of the Waters of the United States (WOTUS) regulations pending a federal court trial on whether the EPA had the authority to issue the regulations and whether the EPA followed proper procedure in developing the regulations. Oklahoma is also one of 29 states challenging the EPA’s Clean Power Plan in federal court. He has parted from fellow state attorneys general in the practice of using external plaintiffs’ attorneys to pursue class action lawsuits against corporate interests. In an interview last year at the conservative Manhattan Institute, Pruitt bragged about Oklahoma being the only state that didn’t sign the multi-state settlement with the banking industry over mortgage abuses. He expressed concern that the suit had become an effort by states to raise state revenue by forcing a settlement. “I filed our own prosecution against the banks and secured $16 million, which went to those who had actually been harmed,” Pruitt said. Scientists continue to disagree about the degree and extent of global warming and its connection to the actions of mankind. That debate should be encouraged—in classrooms, public forums, and the halls of Congress. It should not be silenced with threats of prosecution. Dissent is not a crime. Opposition to Pruitt has been immediate and forceful. “It’s a safe assumption that Pruitt could be the most hostile E.P.A. administrator toward clean air and safe drinking water in history,” said Ken Cook, head of the Environmental Working Group. U.S. Sen. Bernie Sanders (I-VT) was one of several Democratic legislators alarmed at the announcement. Whoever heads the EPA, it may be too late for new federal regulations to stop the momentum of investors and market forces shifting away from a reliance on the most polluting fossil fuels and toward renewable energy sources. Moreover, some states such as California have enacted their own policies on greenhouse gas emissions. The Trump administration’s decisions will be important but not the only factor in the global effort to arrest climate change. In Tulsa, Oklahoma, a white riot in 1921 killed as many as 300 Blacks and left homeless thousands more. For decades, this history was buried, but in recent years the details of the event have resurfaced. Now, the mayor has ordered a search for mass graves.